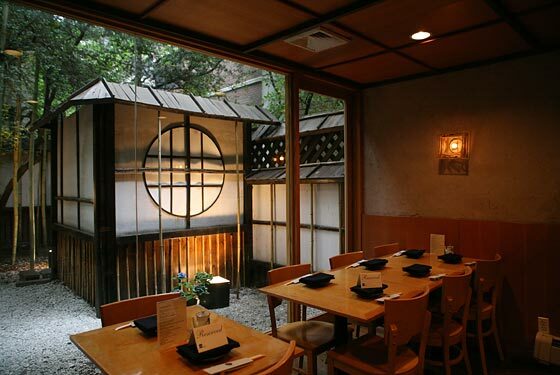 My favorite place for a relaxing and restorative respite from running through the gauntlet of a hard day’s work here in midtown Manhattan, Restaurant SEO offers an unparalleled combination of value, quality and consistency: a virtual trifecta of delicousness. $12 affords you the choice between three delicious specials. 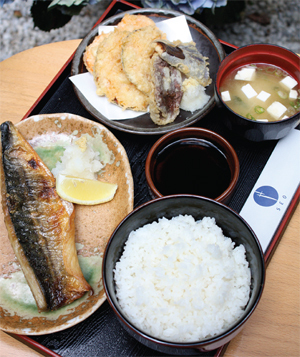 1) broiled mackeral (pictured above), 2) eel over rice, 3) chirashi. Though you can’t go wrong with either of the selections, it’s the chirashi that never fails to send me into a spiral of epicurean ecstacy. Layered atop a pillow of perfectly cooked rice, ever-so-lightly tinged with the sweet tang of rice wine vinegar, the featured sashimi selections–which change according to market availabilities–are consistently of the highest caliber. Today’s selection included a generous total of 8 slices of sashimi: tuna (maguro), salmon, yellowtail, snapper, fluke and sea urchin along with a thick slab of egg omelette. Oishi. In an effort to ensure the corners of your appetite are fully rounded out by meals-end, the lunch special is always accompanied by a modest portion of delightfully crunchy vegetable tempura and a bowl of miso soup, which, in the case of Restaurant SEO, somehow elevates it’s ubiquitous role in Japanese restaurants to a higher level. Ah, to be sitting in Restaurant SEO’s comfortable wood-paneled dining room, sipping green tea from a glazed earthenware cup, gazing out upon a traditional rock garden, perhaps catching tasty notes of Brazillian-influenced jazz playing between the soft pitched conversations of fellow diners. 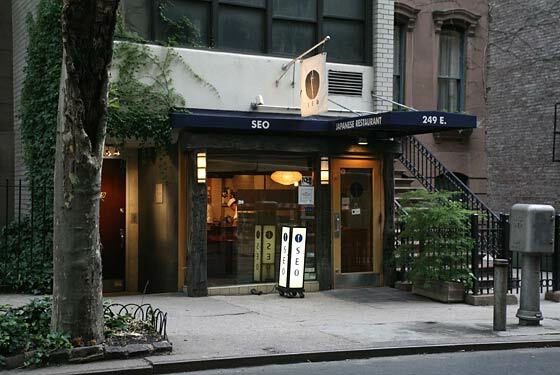 Located at 249 East 49th street between 2nd and 3rd avenue, Restaurant SEO attracts an interesting blend of multinational clientele, owing likely to its position within walking distance from the United Nations. As such, the flowing cadence of Japanese being spoken are as frequently juxtaposed by the lilting sounds of French or German. In a bit of a departure from the traditional Japanese aesthetic, autographed photos of famous Yankees line the walls of the stairway down to the bathrooms downstairs. Though seemingly out of place in SEO’s Zen-like confines, the Good Herring (a New York Met fan, for the record) surmises their presence was a subtle nod to former Yankee World Series MVP and Japanese ex-pat Hideki Matsui who used to be a frequent customer…maybe it was the lunch special?